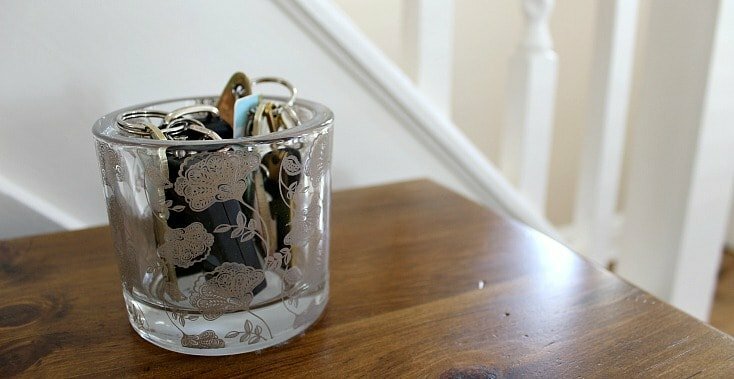 3 steps to take to avoid losing your keys ever again! THE 3 STEPS TO TAKE TO AVOID LOSING YOUR KEYS EVER AGAIN! This is a 3 step process – making sure that you have covered all angles of where your keys could be lost – so let’s get going shall we and I shall reveal all! Making your keys hard to lose in the first place has got to be better than having to find them once lost – so that’s where I want to start. And for items that you lose a lot, the answer is so so simple. It’s just to have a designated place for your keys in your home. I have a small glass bowl on my hallway table where we put all our keys as soon as we come into the house. It isn’t visible from the front door or any windows, so is safe to use here, but is totally visible for anyone in the house needing to grab the keys quickly. It’s also a great way to be able to glance and check they are there when passing. Having the keys on the hallway table is the perfect place in our house to put them down because we have them in our hands having just unlocked the front door – and the next time we should need them is to open the front door again. Simple – but very effective. Starting with this habit should prevent your keys from straying too far around your home, but what happens when you leave your home? I know I have been in the situation where I have got home and stood by the front door unable to find my keys in my bag. I spent far too long searching the depths of my bag, starting to panic slightly that they had been lost, only to eventually find them lurking at the very bottom of the bag…. This not only takes time, but also means that you can never be sure that you have your keys – which can be quite worrying to say the least. When out and about it’s just as crucial to have a designated place for your keys as it is when you are at home. As such, I have made sure that I use a small zipped pocket in my handbag so that I can quickly reach them and know they are there, and they are easy to access when I get home/to the car. 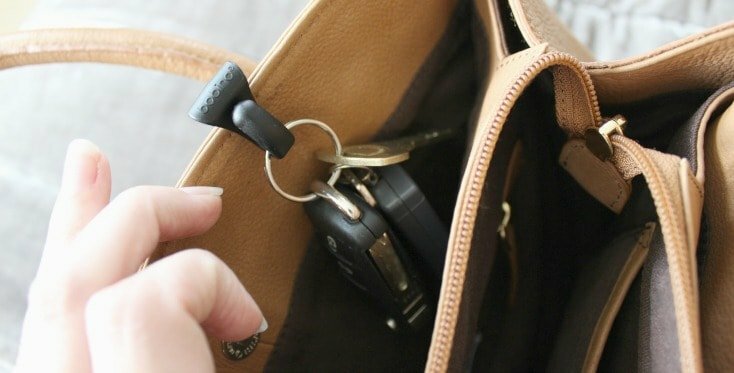 Of course – some bags don’t have pockets – so I love the idea of this clip ** which just attaches to your bag to avoid your keys dropping to the bottom – perfect! (and it comes in lots of different colours). TIP – Make sure your keys are never visible to anyone else, as you don’t want them stolen…. TIP – Only ever take crucial keys out with you – leave the rest at home. A heavy and bulky key ring is harder to use, large to store, and unwieldy. 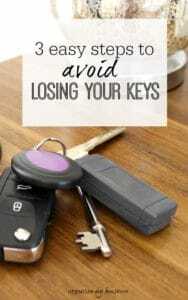 However much you try and prevent your keys getting lost, it’s worth having a plan should the worst happen. As such, I love the idea of using a bit of technology to help in this situation, and so I turned my attention to trackers that are available now. Here are two trackers I really like the idea of – one a little more techie than the other – but it depends on what you prefer (as always, whenever you choose something to help you stay organised, make sure that it is right for you and will be easy to use – otherwise it will just end up being clutter). Nice and simple, yet very effective. You can get different version of this, but I liked the look of this one so got one to try out. Basically – you get 4 keyrings and a remote control unit. You simple attach a key ring to whatever sets you have (the picture below shows a purple tag on my own keys), making sure batteries are in both the key ring and the remote control. 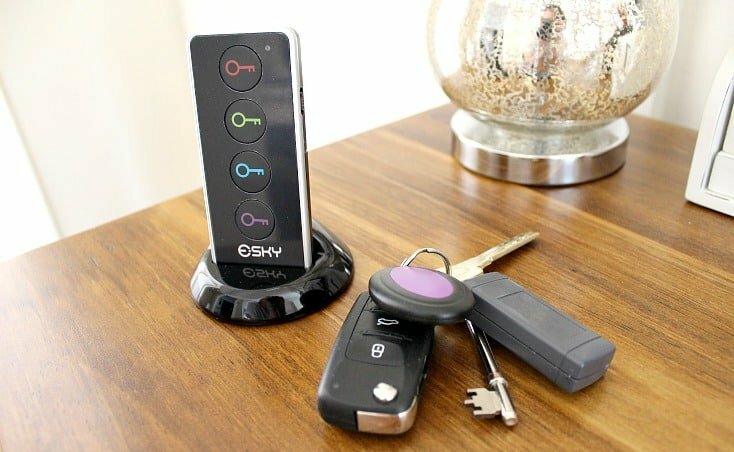 When you lose your keys, you simply press the matching coloured button on the remote and the keys will beep loudly so you can track them down. Now this ** could have been far too techie for me – but I liked the idea so I went and got one yesterday – and so far so good! 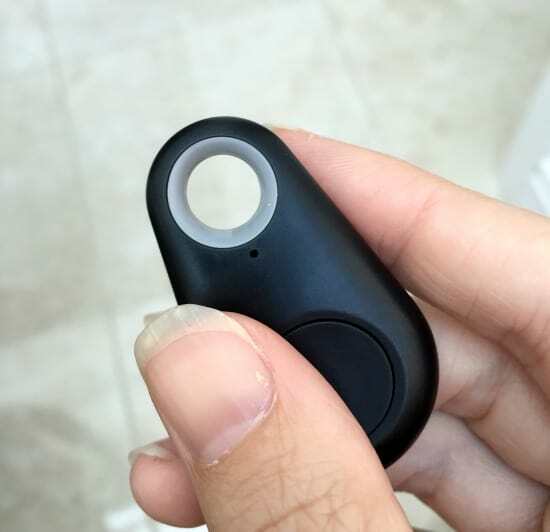 You simply download an app to your phone (free), and attach the fob to your keys (turning it on, battery says it lasts 6 months and was included). When you lose your keys then you just go to your phone and click on the app and your keys will beep to show you where they are. You can also get it to show you on a map where they are if they are out of the house and further afield – although I haven’t used this feature as yet. One idea I love is to leave the fob in your car and let your phone lead you back using the location function – as this would be really useful in large car parks or when you have parked in an unfamiliar place. A great find for gadget lovers! So – in summary – if you can create a designated place for your keys at home AND keep them safe and accessible when you’re out and about, then you’re highly unlikely to ever lose your keys again. But, if you do, preparing for the worst right now by having a way to find them, will mean they won’t stay lost for long (fingers crossed! ).